Patra's Other Place: Weather vane in our yard. Ken loves those old fashioned weather vanes, and has been keeping an eye out for one when we've been shopping off the beaten track, thinking you would only find them in country towns. Today we were in Bunnings and Ken asked one of the floor walkers if they sold weather vanes. The girl looked blank and said "What's that?" We described one to her and she said "Oh yes, I think they have them down in the garden section". That made sense, so we wandered in there to have a look. Couldn't find a weather vane, and when we asked one of the sales staff in that section, we got the same blank look. She asked someone else who said they were in Aisle 23, so off we trotted. In Aisle 23 we asked another staff member who showed us the electronic weather stations, and we said no, we wanted an old fashioned weather vane. The bloke shrugged and turned away, but another customer standing nearby pointed down the end of the aisle and said "There they are, on the left hand side". And so they were. We had walked right past them - a pile of boxes on the floor with a big sign "Clearance items - $19". 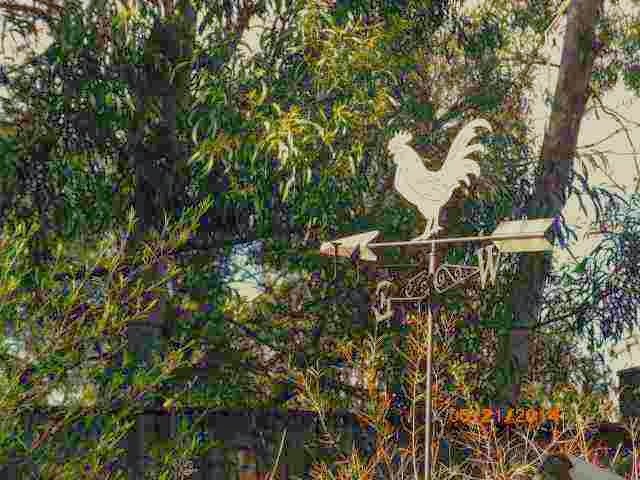 So Ken got his weather vane, and it is now perched on top of the aviaries (the highest point in our back yard) and the rooster on his arrow will now tell us in which direction the wind is blowing. Wow. This photo makes it look silver, but it is actually dark brown aged metal look, and only looks light in this photo because the sun was shining on it. That's a very good looking weather vane! I'm always surprised when someone doesn't know what I'm talking about. Surprised and disgruntled when it makes me feel old!